Watercolor-like diagonal stripes float across Hemangini Singh's airy, hand-dyed scarf. Imagine you're a poet. (Maybe you are.) You write a subtle, perfect haiku about summer skies. Sunny skies, rainy skies, evoked in 17 syllables. You give your pretty poem to a watercolorist (still with us?) who turns it into a beautiful painting. (We'll get to the scarf soon.) Watery shadings of blue and gray alternate in soft, diagonal stripes, painted with the inimitable, perfectly imperfect touch of the human hand. Then a magical pixie shows up and turns it into a scarf. (We never promised plausibility.) 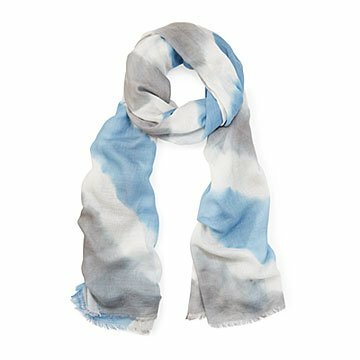 This is the one and only way we can truly describe this wondrous work of art: it's a haiku, translated into a watercolor, transformed into a super-soft, floaty, airy, scarf. Hemangini Singh is the poet/painter, who designed this scarf in her New York studio. Made in India using a hand-dying technique known as leheriya ("waves").